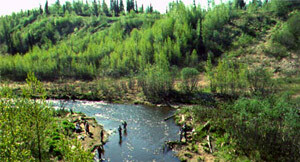 The sport fisheries in the Lower Cook Inlet Management Area are primarily accessed along the Sterling Highway. Homer is the largest community in the area but other small communities such as Ninilchik and Anchor Point are located along the Sterling Highway. These communities have many services available including: motels, bed and breakfasts, restaurants, private and public camping, boat launches, and parking areas. Daily air charter services are available from Anchorage to Homer. Access to remote fisheries is possible via boat, water taxi, and small plane charters. During the summer sport fishing season, ADF&G provides weekly fishing reports and updates salmon escapement monitoring daily. ADF&G also issues news releases and emergency orders throughout the fishing season that change sport fishing regulations.